SCVHistory.com CO7401 | College of the Canyons | Gov. Ronald Reagan at IRC Dedication, 4-22-1974. April 22, 1974 — California Gov. 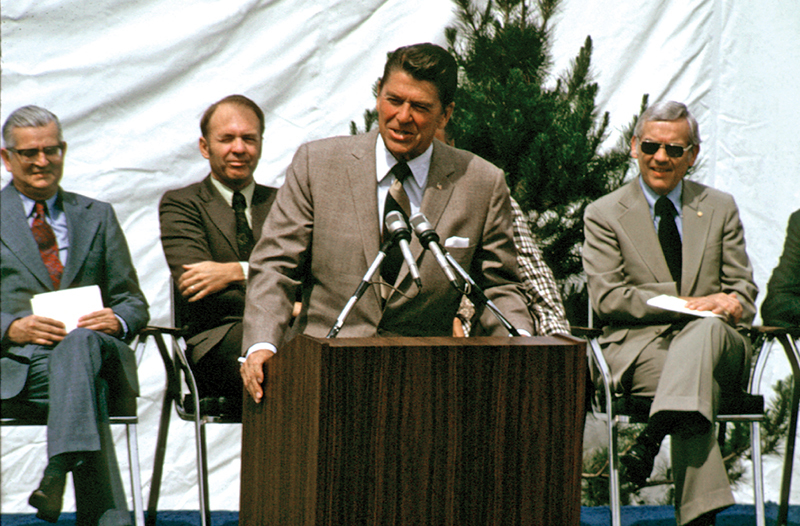 Ronald Reagan addresses a crowd at the dedication of College of the Canyons' first permanent building, the Dr. William G. Bonelli Instructional Resource Center on the Valencia campus. At (the viewer's) far left is Dr. Robert C. Rockwell, the first Superintendent-President of College of the Canyons (July 1968-June 1979). Between Rockwell and Reagan is Municipal Court Judge Adrian Adams, whom Reagan had appointed to the bench four years earlier. At this time, Adams was chairing the effort to fund the construction of the nonprofit Henry Mayo Newhall Memorial Hospital, which opened in 1975. The IRC and other permanent buildings were funded through a combination of state moneys and a local match. Of a statewide $160 million construction bond passed in November 1972, COC was allocated $11.2 million, contingent on local voters pitching in $2.5 million. They did more. On Feb. 6, 1973, they overwhelmingly passed an $8 million construction bond measure. The $3.25 million IRC, with 26 classrooms and faculty offices, opened in early 1974. Early History of College of the Canyons. It all began in 1967. The residents of the Santa Clarita Valley wanted a college to call their own, and on November 21 of that year they voted overwhelmingly to make it happen. Voters approved the creation of a junior college and elected a five-member board of trustees to shepherd its transformation from an idea into reality. Optimism abounded for what lay ahead in this once-sleepy whistle-stop along Southern Pacific Railroad's Los Angeles-to-San Francisco line. With a population of fewer than 60,000, the community looked much different in the 1960s. In what we now call Saugus and Canyon Country, a growing assortment of tract homes was sprouting — although vast expanses of vacant or agricultural land still separated the valley's distinct communities. Downtown Newhall was the established commercial center, featuring car dealerships, a supermarket, a bank and many other merchants that have since relocated. During the summer of that pivotal year of 1967, the master-planned community of Valencia was born, luring young families from over the hill with homes priced at about $25,000. Valencia Town Center did not exist, of course. Neither did the Valencia Auto Mall. Magic Mountain, Henry Mayo Newhall Memorial Hospital and California Institute of the Arts were several years from appearing on the local landscape. There was no Stevenson Ranch, just a vast unadulterated plain accented by rugged foothills that have since been terraced and built upon. Old Orchard Shopping Center on Lyons Avenue and The Newhall Land & Farming Co.'s first golf course — known today as Valencia Country Club — were barely two years old. The Valencia Industrial Center was just beginning to be developed. The single-screen Plaza Theater in Newhall and the Mustang Drive-In off Soledad Canyon Road were the only local cinematic venues. The emergence of the Santa Clarita Valley as a viable place to live, work and play was precipitated by several key developments, chief among them the country's post-war westward migration and California's exploding growth. But the two greatest obstacles to the valley's growth — limited access and an insufficient water supply — were in the process of being eliminated. The old Highway 99 was steadily being circumvented by a major north-south freeway, Interstate 5, that would cut a vital swath through the Santa Clarita Valley on its way to becoming California's most important roadway, connecting north with south, border to border. And, following California voters' approval seven years earlier to bring state water south, plans were moving forward for a major new State Water Project reservoir in Castaic. This project, part of what would become the biggest water-delivery system in the world, finally ensured a reliable source of water. All of these developments helped set the stage for the transformation of a dusty domain of cowboys and sodbusters to a rapidly growing suburbia, one that would need a public institution of higher learning. Thus was born the Santa Clarita Community College District and its campus, College of the Canyons, which would go on to become the fastest-growing community college in California. Things moved quickly once voters gave the go-ahead. The Board of Trustees — President William Bonelli Jr., Vice President Edward Muhl, and members Peter Huntsinger, Sheila Dyer and Bruce Fortine — began functioning as an official body on December 5, 1967. They initiated a search for someone who could put the wheels in motion, eventually deciding upon Santa Barbara City College President Dr. Robert C. Rockwell. He became the first superintendent of the Santa Clarita Valley Junior College District, as it was then called, and the first president of its single campus, a college that would later adopt the familiar name College of the Canyons. Other names were considered for this new junior college district. Among them were North Valley, Upper Santa Clarita Valley, Bouquet, Canyon and Vasquez. Asked why he would even consider leaving such a plush coastal clime for a dusty semi-desert outpost, Rockwell replied: "A college president has very few opportunities to create an entirely new college, and I'm still young enough to do it — and I want very much to do it." The trustees liked his answer, as well as the fact he had experience when it came to building a new college. Some years earlier, he had overseen the construction of Cerritos Community College. Accompanying Rockwell from Santa Barbara was his loyal vice president, Gary Mouck, who would stay on at College of the Canyons after his mentor retired. "College of the Canyons is what it is today because Bob Rockwell was the right man at the right place at the right time," Mouck said. "There is simply no question about that. He brought invaluable experience and an innate leadership quality to the project." The Newhall Land & Farming Co., from whom the land that would become College of the Canyons was later purchased, presented the fledgling college with a $140,000 gift. A chief executive of the company said the principal reason for the gift was "because Dr. Rockwell was there." Rockwell, Mouck and the trustees soon began the crucial task of finding the people who would give life and character to the new college. First to be built was an administrative staff, composed of Charles Rheinschmidt, assistant superintendent-student personnel; Carl McConnell, dean of admissions and records, and Joleen Block, director of library services. Rockwell often boasted that he had personally "hand-picked" the college's instructors. But they first had to get past Mouck, who interviewed each and every one of them. During the months leading up to opening day in the fall of 1969, he and fellow administrators turned their attention to building the first faculty. They sifted through the resumes of some 4,000 applicants. Of those, just 31 would be chosen. Recruited were William Baker, communications; James Boykin, biological sciences; Louis Brown, police science; Steven Cerra, history; Theodore Collier, political science and history; Robert Downs, music; Alice Freeman, English; Kurt Freeman, psychology; George Guernsey, technology; Mildred Guernsey, mathematics; Ann Heidt, art and English; Donald Heidt, English; Donald Hellrigel, foreign language; Elfi Hummel, foreign language and drama; Leonard Herendeen, police science; Iris Ingham, art; Jack Israel, physical education; Edward Jacoby, physical education; Jan Keller, librarian; Thomas Lawrence Jr., physics; Clifford Layton, business and mathematics; Betty Lid, English; J.J. O'Brien, police science; George Pederson, police science; Lynora Saunders, physical education; Lee Smelser, physical education; Dale Smith, sociology and anthropology; Gretchen Thomson, history; Gary Valentine, chemistry and biology; Frances Wakefield, counseling, and Stanley Weikert, business. The composition of the original Board of Trustees elected in 1967 changed, as John Hackney replaced Sheila Dyer in 1969. The challenges facing the young district were formidable. Even with the key people in place, the college still existed in concept only. There was nothing yet tangible — and very little money. By May of 1969, the college's first catalog was ready to go — minus one important detail. "There was no cover because the college didn't have a name," Mouck recalled years later. That issue would soon be resolved. Mouck was in his office one day in early 1969, examining topographic maps of the Santa Clarita Valley, when he noticed the large number of canyons. "I counted over 50. So I yelled out, 'How about College of the Canyons?' " There already was a College of the Desert and a College of the Redwoods, so College of the Canyons made sense, he reasoned. On May 15, 1969, the Board of Trustees agreed. The name "College of the Canyons" won out over several other suggestions that included Santa Clarita College and Valencia College. The rationale behind the selection of the cougar as the official mascot was far less complicated. "I came up with cougar because I liked cougars," Mouck said matter-of-factly. Attention soon turned to the reason Mouck was examining topographic maps in the first place. The college needed a permanent home. Although much vacant land existed in 1969, a significant portion of it was owned by one company, Newhall Land. The college identified some 45 possible properties on which to build, including land that Newhall Land and Sea World planned to transform into a major theme park. That place would open on May 29, 1971 as Magic Mountain and quickly become a regional landmark, but only after Newhall Land made college leaders an offer they couldn't refuse. Not wanting its land acquired through eminent domain, Newhall Land made the college district a generous offer. The company would sell the district more than 150 acres along Interstate 5 near Valencia Boulevard for about $10,000 an acre, then return 10 percent of the purchase price as a gift. Now, all the district needed was the money. With hundreds of prospective students eagerly awaiting the opening of their new college, temporary quarters were arranged at Hart High School (see photo at right). It was there, in a Newhall Avenue bungalow, that College of the Canyons officially opened on September 22, 1969, welcoming its first class of students. Rockwell expected about 600 people to sign up for the fall quarter. But, in a precursor to the years that would follow, demand was under-estimated as 735 students showed up. Administrative offices were located several blocks away, at 24609 Arch Street, in a strip-mall storefront just over the railroad tracks at San Fernando Road. The college organized its first-year schedule around the quarter system, with the winter quarter starting January 7, 1970 and the spring quarter commencing April 8, 1970. There was no summer quarter. Courses of instruction were comprehensive for such a new institution. More than 150 classes were offered in anthropology, art, astronomy, automotive technology, biological sciences, business, chemistry, communications, economics, engineering, English, French, geography, geology, German, health education, history, home economics, library technology, mathematics, meteorology, music, philosophy, physical education, physics, police science, political science, psychology, social science, sociology and Spanish. The college fielded its first athletic teams in baseball, basketball, cross country and track under the auspices of the Desert Conference. Student activities began immediately. The college's first student body president, Paul Driver, was elected. The first issue of the student newspaper, introduced as "The College Sound," rolled off the press in November. A steady succession of events with names such as Sweethearts Dance and Annual Awards Banquet followed, as did theatrical productions such as "The World of Ferlinghetti" and "Our Town." Before long, the college's first commencement day arrived. Assembled in the Hart High cafeteria that June day in 1970 were Dennis Agajanian — the first to be handed a College of the Canyons diploma — Karen Bright, Karen Coe, Penny Curtis, John Dalby, Richard Dalmage, Loren Elmore, Stuart Harte, Rita Hendrixson, Gregory Jenkins, Andrew Kress, Georgia Lucas, Emily Sifferman, Shirley Stein, Robert Wilder and Wayne Williams. These 16 people hold the distinction of being the very first graduates of College of the Canyons. "The first year of operation of any new college is never easy," Rockwell remarked during the ceremony. "The challenges are numerous. All of you have met these challenges and, in doing so, have achieved an enviable place in the history of this college." The Hart High campus filled an urgent need, but it was ill-suited to accommodate a growing number of college students for very long. College hours were severely hampered because classes could begin only in the late afternoon, after high school students had left for the day. Sure enough, before the year was out, College of the Canyons would have a new home. That January of 1970, voters gave their resounding approval to a $4 million construction-bond issue so that College of the Canyons could create a permanent campus. Soon thereafter, the district took Newhall Land up on its earlier offer and purchased 153.4 acres of land bounded by Valencia Boulevard on the north and Interstate 5 on the west. "Ultimately we obtained the best site of all," Mouck said, referring to the gently rolling oak-studded hills along the east side of Interstate 5. Local pioneers had a more ominous moniker for this parcel of land. They called it "Rattlesnake Gulch." College of the Canyons moved out of the Hart High campus in July, setting up a temporary admissions office in a garage on Pine Street until the new campus was ready. Just 10 months after voters passed the bond issue, temporary buildings housing 99 classrooms were erected (see photo above), although construction problems delayed the opening by two weeks. The college's first on-campus classes began on October 5, 1970 in an assemblage of prefabricated buildings that faculty, staff and students would alternately call the "Instant Campus" or "Stalag 13," the latter a reference to the stark prison camp featured in the TV sitcom "Hogan's Heroes." Once the village of modular buildings was in place, work commenced on the adjacent football field and surrounding all-weather "Tartan track." The massive concrete stadium and lights would come later, after the visitors' stands were built. At the start of the second academic year, more than 1,200 people were attending classes. It was a strong indicator of community need and the growth yet to come. The growing student body was now offered more than 225 courses taught by an ever-growing faculty team. New instructors included Roger Basham, anthropology; Marcia Boehm; Carl Buckel, management; Janice Burbank, nursing education; Dorothy Burtch; Doris Coy, business and economics; Barbara Hamm; Willard Kiesner; Roseann Krane; Chris Mathison; Robert McNutt; Stanley Newcomb; Ken Palmer; Anton Remenih, communication services; Robert Seippel; Carl Seltzer; William Solberg; Betty Spilker, English, and Winston Wutkee, geology. Joining the administrative team in 1970 were Robert Berson, assistant superintendent-business services, and Alduino Adelini, dean of student activities. Putting the new football field to good use was the college's first gridiron squad, which announced its arrival by winning the season opener against the Cal Lutheran junior varsity team by a score of 49-6. The 1970 Cougars, coached by Don Kloppenburg, finished the season with a 7-2 record, second in the Desert Conference and fifth in the state. The first-year team also produced an All-American in tailback Clint McKinney, who gained the most yardage — 413 in 41 carries — in a single game in the history of American college football. By comparison, O.J. Simpson ran a record 304 yards at San Francisco City College in 1965. McKinney was named MVP of the Desert Conference and was presented with a special trophy from Sports Illustrated magazine. The cross-country team, headed by coach Ed Jacoby, won the conference championship. The harriers' captain and star was Mike Martinez. The college's Alma Mater, authored by music instructor Robert Downs, appeared for the first time in the 1970-71 Cougars Handbook: "All hail to Thee with melody, our voices strong and clear. We pledge to Thee our loyalty in terms for all to hear. And when we go our way, we will say we have known you, Alma Mater, strong and true. Our College of the Canyons and a Cougars' victory! All hail to Thee." Students held their first welcome dance of the new academic year at Hart High, whose multi-purpose room was still larger than anything at the new campus. Performing on stage was an oddly titled band called "Shmoogi," whose roster included a young Curtis Stone. Stone, son of the late music legend and Saugus resident Cliffie Stone, would later find stardom as a founding member of the band "Highway 101." Meanwhile, the once-virgin hills of Rattlesnake Gulch were being remolded by dozens of clattering steel behemoths that kicked up an endless supply of dirt and dust in their quest to create a habitable college campus. The street address for this new college was 25000 Valencia Boulevard, as Rockwell Canyon Road did not yet exist. Unlike the present-day campus, the new college had a serious parking shortage. Consequently, during class hours hundreds of cars were parked bumper to bumper along both sides of Valencia Boulevard. Improvisation was the order of the day. Students could occasionally be seen hosing down the inevitable layer of dust that accumulated on just about everything, while instructors often abandoned the confines of the prefabs to teach outdoors. Basketball coach Lee Smelser once conducted a class while perched atop the back of a truck, and English instructor Betty Lid transformed a trash can into a speaking lectern. On October 26, 1970, during a twilight ceremony under a mammoth green-and-white tent, College of the Canyons was officially dedicated. More than 700 people showed up to witness the hourlong event in the center of the campus. Special guest speakers were comedian Bob Hope and U.S. Sen. George Murphy (in photo at right). "The pioneer spirit of the West is still here," said Murphy, whose previous career as an actor featured roles on Broadway and in some 55 feature films. "Nowhere have I witnessed a modern-day demonstration of our great pioneer spirit that surpasses the one taking place right here on this campus." When it was his turn to speak, Hope, the legend of standup comedy and the silver screen, broke character by taking a serious swipe at campus radicals, reflecting the university unrest of the day. "I can't understand how people can burn down college buildings," he said. "For fine young students to be denied an education by a lousy fringe group is the biggest crime in our history." He also added his lighthearted take on the event, of course. Referring to the tent in which everyone was assembled, Hope quipped: "I haven't worked anything like this since Ringling Bros." And, after taking in a long, deep breath, he added: "I'm in shock. This fresh air grabbed me. I'm not used to it. I'm from Burbank." Other distinguished guests that day were California Assemblyman Newton Russell, Sen. John Harmer, Los Angeles County Supervisor Warren Dorn and the Rev. Robert Bingham, who delivered the invocation and benediction. "Our goal is not to provide just a college for the community, but a college of quality, one that will be admired and used as a model throughout the state," Rockwell said to the assembled guests and dignitaries. "With our staff and administration, this goal is within our grasp." The timing of the 6.4-magnitude Sylmar earthquake on February 9, 1971 was fortuitous for College of the Canyons. No permanent campus structures yet existed, but the architectural plans for the buildings on the drawing board were beefed up significantly to make the college's first structures among the safest in California. "The Student Center was supposed to be two stories, but everything changed the day of the Sylmar earthquake," said Al Adelini, who served as dean of student activities. "That was a very fateful day for the college, and we became the most earthquake-ready facility in the whole valley." Hardest hit during the quake — which was strong enough to topple the lofty Interstate 5-Highway 14 connectors that were then under construction — was the Instructional Resource Center (now called Bonelli Hall), where librarian Jan Keller estimated that some 10,000 volumes lay buried under displaced steel shelves. It took two days to sort through the mess and re-shelve the books. Eighty-nine students graduated during the college's second commencement ceremony — the first to occur on the permanent campus — in 1971 (see photo above). The figure was more than five times greater than the 16 graduates a year earlier — and a portent of things to come. By the fall of 1971, enrollment continued to experience dramatic growth, reaching 1,700 students — more than twice the number of students enrolled in classes during the first year. The number of college personnel also continued to grow to meet the increased enrollment demands. Hired to serve as dean of vocational-technical education in 1971 was Robert Pollock, and new faculty members included Hazel Carter, nursing education; Henry Endler, transportation; Robert Freeman, music; Helen Lusk, nursing education, and Larry Reisbig, physical education. The college's new vocational nursing program awarded 11 students with nursing caps in April 1971. The mid-year "capping" ceremony marked the halfway point for the students, who were enrolled in an intensive training program that included more than 1,000 hours of clinical training at Inter-Valley Community Hospital in Saugus and Golden State Memorial Hospital in Newhall. "You are preparing yourselves for a noble calling," Assistant Superintendent Mouck told the students. The class later graduated in August. Meanwhile, a wayfaring pair of geology and anthropology instructors began conducting field trips that would become institutional traditions — and wildly popular among students. Geology instructor Winston Wutkee, a strong believer in hands-on rock hunting, led several field trips to places such as Acton, Tick Canyon, Death Valley and Gold Rush country, where students could find and inspect actual specimens on their own. Likewise, anthropology instructor Roger Basham led several expeditions in which students participated in archaeological digs. Among the destinations was a site near the then-new Castaic Dam to unearth evidence of a Chumash tribe that once inhabited the area. Another focused on a dry lake bed near Taft, where students dug up arrowheads, beads and other artifacts left behind by the Yokuts, who occupied the San Joaquin Valley for some 7,000 years. The community was apparently satisfied with the college's progress, deciding to maintain the status quo on the college's Board of Trustees. Three members — Peter Huntsinger, William Bonelli and Edward Muhl — won re-election in April 1971. And, events in Southeast Asia continued to polarize public opinion. The case of Army Lt. William Calley, accused of massacring innocent civilians at Mai Lai, was the subject of a heated April 29 student forum organized by communications instructor William Baker. The college debuted its new marching band and crowned its first homecoming queen, Vicki Sinclair, during half-time ceremonies in November. The mighty Cougar football squad dispensed the College of the Desert Roadrunners by the score of 49-0. The 25-piece band was assembled by music instructor Robert Downs. As 1972 began, it was impossible to ignore the small mechanized army of bulldozers and graders that was reshaping the property south of the temporary campus. The $1 million project was preparing the land for the buildings that would eventually rise from the site, including the first planned permanent building, the Instructional Resource Center, as well as the Classroom Center, Laboratory Center, Student Center, Vocational-Technical Building and portions of the Physical Education Center. Sadly, Dr. William Bonelli, the recently re-elected first president of the Board of Trustees, did not live to see the college's first permanent building. He died suddenly on February 22, 1972 at the age of 49. The college's first permanent building, the Instructional Resource Center, would be renamed in his honor. Newhall's postmaster, Francis Claffey, was appointed to fill the vacant board seat. The second commencement ceremony on the permanent campus produced 143 graduates — up from 89 the previous year. The college was experiencing solid growth, but even that was dwarfed by bigger news: Construction of the Dr. William G. Bonelli Instructional Resource Center was authorized to move forward. In November 1972, voters statewide authorized the $160 million Community College Construction Act, which was worth about $11.2 million for College of the Canyons — provided that local citizens came up with at least $2.5 million in matching funds. The challenge galvanized the community. Elisha Agajanian, board chairman of Santa Clarita National Bank, and Blake V. Blakey, manager of Anawalt Lumber & Materials Co. in Newhall, headed a group of some 40 community leaders who organized the Citizens' Committee to Complete College of the Canyons. The outcome was extraordinary. On Feb. 6, 1973, local voters threw their enthusiastic support behind an $8 million bond issue to meet the matching-funds requirement of the earlier statewide measure. In fact, nearly 80 percent of the local electorate voted to support the measure, far surpassing the required two-thirds majority. Construction of the Instructional Resource Center (IRC) and an auto shop building was already under way. With the funding now in place, the core campus — most of it, anyway — could now be completed. Buildings began opening in rapid succession, with monikers such as "Instant Campus," "Rattlesnake Gulch" and "Stalag 13" fading into history. The new bond funding paved the way for five major building projects: the Laboratory Center, Classroom Center, Student Center, Vocational-Technical Building and Physical Education Center. The college's original master plan also called for a Theatre Arts Building, Music Building, Business Education Building and Classroom-Administration Building, all of which were scheduled to be built later in the decade. Ultimately, the college envisioned under the first master plan would be able to accommodate 7,500 students — a capacity that would be met and surpassed far sooner than anyone realized. The first permanent building to be completed was the IRC (in photo at left, at the beginning of construction). More than half a million cubic yards of earth were moved to make way for this first building, which cost $3.25 million to build and housed 26 classrooms and faculty offices. As the IRC was completed and its classroom space made available in early 1974, the modular structures that had served as the college campus were abandoned and removed. At the same time, five other buildings were in various stages of construction. The IRC was officially dedicated by Governor Ronald Reagan on April 22, 1974. The dedication ceremony was a proud and lavish affair, with a large stage erected on the football field to accommodate the governor and other luminaries. Reagan arrived by limousine and met privately with college officials in the old board room, which was located inside a modular building behind where the present-day stadium scoreboard sites. Hundreds gathered in the field's visitor's stands as armed, mounted police officers patrolled the hillside above. 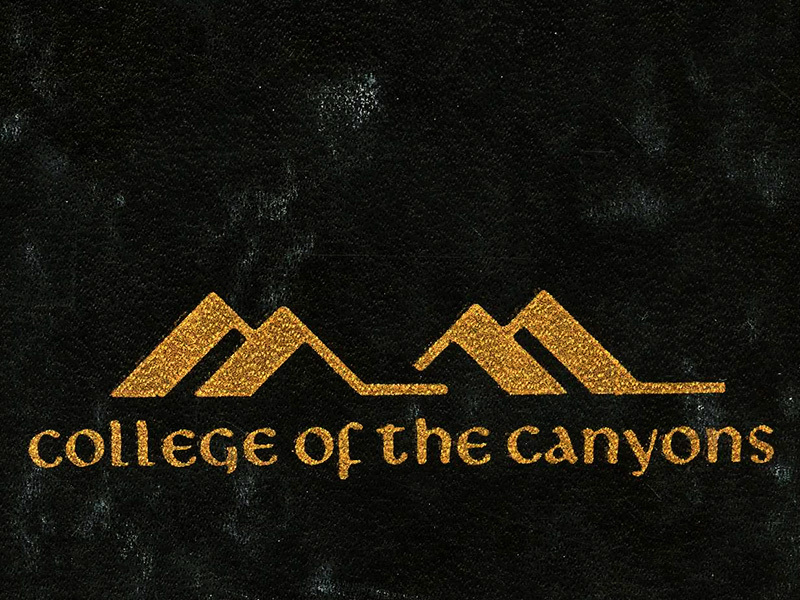 As the fall of 1974 approached, it was becoming abundantly clear that College of the Canyons had a vital purpose and an ever-expanding following. As the college entered its sixth academic year, enrollment rose to 2,542 students — an all-time high. It was a time when many young people were returning from combat in Vietnam. The student population reflected this trend, with a full 30 percent of students being veterans. The conflict in Vietnam would officially cease the following year. The 6,000-seat Cougar Stadium officially opened for the football team's first home game of the 1974 season on September 21 of that year. Unfortunately, the Cougars fell to Los Angeles Harbor Community College by a score of 26-21. The Classroom Center and Laboratory Center, two separate structures that were built on either end of the IRC, opened in January 1975. To the casual observer, the combined structures appear to be one large building, but they are actually three separate structures. At the points at which the buildings appear to touch, they are in fact a few inches apart, the gaps along the outdoor walkways covered with steel expansion plates. The scaled-back Student Center, now relegated to a single story in the interest of earthquake safety, opened in February of 1975. The first on-campus dining facility opened here in September, offering a hamburger for 60 cents, a grilled-cheese sandwich for 40 cents and a large Coke for 35 cents. The Student Center was used for the first graduation ceremony of the Licensed Vocational Nurse Program. Sixteen students graduated. The $1.2 million Vocational-Technical Building, housing programs in welding, automotive repair and home economics, opened to some 500 students in the fall of 1975. And, the nearly $5 million Physical Education Complex, housing an indoor swimming and diving pool, basketball court, gymnastics room and weight-training room, opened in March 1976. The opening of this building signaled the end of construction of the original core campus. The Santa Clarita Valley now boasted a stunning college campus that was the envy of many a community. "The modern architecture utilizes the natural landscape, reflecting in its design the spaciousness and simplicity of the terrain," noted a college brochure from 1975, explaining the design philosophy of the new campus. "While certain changes in the hillsides must be made to complete the program, every effort has been made to ensure ecological protection." The sturdy, massive poured-concrete structures were designed to withstand 100-year earthquakes and went well beyond state safety laws. "I doubt that we could afford to build like that today," Rockwell commented some years later. "I guess what the founding Board of Trustees and I are proudest of is the fact that we planned well for the future. It's paying off handsomely now and will for decades to come." Rockwell served College of the Canyons for more than a decade, retiring in late 1978 and accomplishing precisely what the first Board of Trustees asked him to do: Build not just a college, but a foundation on which to build. "I am proud of College of the Canyons," Rockwell said. "I consider it the culmination of a career."